Around the world, obesity and diabetes are reaching to epidemic proportions. A study published in the medical journal Lancet titled ‘Global, regional and national prevalence of overweight and obesity in children and adults during 1980-2013: A systematic analysis for the Global burden of Disease Study 2013’ ranks India third after US and China with 30 million of obese people. The major complication of obesity is Insulin resistance leading to type-II diabetes and cardiovascular complications as heart attack, stroke and atherosclerosis . The prevalence of worldwide obesity has increased from 28.8% to 36.9% in males and 29.8% to 38.0% in females between 1980-2013 .The factors responsible for obesity includes dietary trends and habits, physical inactivity, sedentary lifestyle and genetic factors. The preventive measures of obesity include the lifestyle modifications and healthy diet plans. The FDA approved medications for obesity are Orlistat, Lorcaserin, Phentermine/Topiramate, Naltrexone/ Bupropion, and Liraglutide . As obesity is associated with other complications also, drugs recommended for it should have the objective to treat them also, like the anti-diabetic drug metformin which has been found to reduce weight also . In this view adiponectin hormone, released from adipose tissue can serve as important link for treating obesity and its associated complications. It affects the various physiological functions as fat synthesis and metabolism, insulin sensitivity and inflammation. The obese and type-II diabetic persons are reported to have lower blood adiponectin levels than non-diabetic ones . The drug use to treat diabetes–thiazolidinediones, rosiglitazone and pioglitazone increase the expression of adiponectin mRNA in adipose tissue and adiponectin levels in blood. Obesity is a growing health issue around the world and is reaching epidemic proportions in some nations. The problem is not restricted to the inhabitants of the affluent countries, to the adult population or to any one socioeconomic class. Body fat represents stored energy, and obesity occurs when the homeostatic mechanisms controlling energy balance become disordered or overwhelmed. It has become one of the biggest health problems of our times. It is a medical condition where excess body fat has accumulated to the extent that it may have a negative effect on health, leading to reduced life expectancy and/or increased health problems. It is a condition which results from taking more calories in diet than expended by the body’s energy consuming processes. It is a leading preventable cause of death worldwide, with increasing rates in adults and children. Authorities view it as one of the most serious public health problems of the 21st century. Being overweight and obese are two different parameters where overweight refers to an excess amount of body weight that may come from muscle, bone, fat and water whereas obesity refers to an excess amount of body fat only. World Health Organization (WHO) defines obesity as BMI of 30kg/m2 or more and this health issue has been recognized during last 10-15 years . The BMI, Basal metabolic index is the tool use to estimate overweight and obesity. The health risk of obesity includes Type-II diabetes mellitus (T2DM), heart disease, hypertension, osteoarthritis, nonalcoholic fatty liver disease, cancers (colon, breast, endometrial) and polycystic ovarian disease (PCOD) . Diabetes is a group of disorders characterized by high blood glucose due to defect in insulin production or signaling. The two forms of diabetes are Type-I and Type-II where the T2DM is more prevalent and is seen in 90% cases of diabetes and it is also reported that 90% of T2DM patients are obese. The risk factors for diabetes include obesity, high cholesterol, certain medications, age, stress and family history. The diabetic complications are retinopathy, nephropathy and neuropathy. Almost 80% of individuals having type-II diabetes are obese. It occurs because in obesity, the factors responsible for insulin resistance are increased. The factors include the amount of non-esterified fatty acids, glycerol, hormones, glycerol, cytokines, pro-inflammatory markers and many other substances . The relationship between obesity and diabetes is highly interdependent and due to which the term diabetisity has been coined . The adipocytes present in adipose tissue have the responsibility of storing triacylglycerol (TAG) synthesized in the liver. They are insulin sensitive cells which causes them to secrete leptin hormone which helps in the deposition of TAG by multiple mechanisms . In case of obesity, the adipocytes get filled with TAG and become saturated and their sensitivity for insulin decreases. They are not able to further meet the demand of increasing more TAG coming from liver. The synthesis of new adipocytes gets down regulated in adipose tissue but up regulated in other tissues, including skeletal muscles and liver. The TAGs get deposited in these abnormal regions and affecting insulin signaling in skeletal muscles and leading to T2DM (Figure 1). 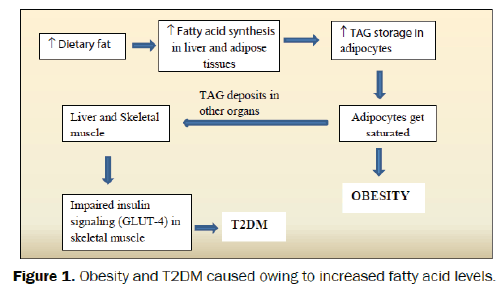 Figure 1: Obesity and T2DM caused owing to increased fatty acid levels. Adipose tissue is a loose connective tissue having large number of adipocytes specialized for the storage of excess triglycerides . But apart from the storage of triglycerides adipocytes also act as an endocrine organ releasing adipocytokines into the circulation. They include leptin, TNF-α, plasminogen activator inhibitor type-1, adipsin, resistin and adiponectin . Adiponectin is a peptide hormone (224 amino acids) that modulates many metabolic processes. It sensitizes other organs to the effect of insulin, protects against atherosclerosis, inhibits inflammatory response, and powerfully affects the metabolism of fatty acids and carbohydrates in liver and muscle , blocks fatty acid synthesis in adipocytes and hepatocytes and gluconeogenesis in hepatocytes. This adipokine is found to be important in the field of metabolomics because of its role in the diseases occurring due to the metabolic complications . The understanding of adiponectin and its downstream targets can be helpful in the development of therapies aiming to control obesity, T2DM and cardiovascular disorders . The research suggests that the risk of T2DM and cardiovascular disorders decreases with increasing plasma adiponectin levels . This can be done either by directly administering adiponectin by injection or by using treatment that increases its plasma levels in circulation and therefore be used to combat the above mentioned diseases. Avocados, olive oil, pumpkins increase adiponectin levels naturally, whereas statins and glucagon like peptide–1 (GLP-1) agonists are drugs responsible for increasing it. Also, adiponectin concentration is found to be elevated with drugs like PPAR agonists, (i.e., thiazolidinediones and fibrates) . Obesity is a major concern in the present world because it is life threatening. And in obese people, the incidence of diabetes and cardiovascular complications are the common issues. The medicines administered to either diabetic patient with obesity or vice versa should have the potential to treat both the complications. In this concern, the agents increasing the levels of adiponectin can prove to be a useful therapy as it possesses various physiological properties of anti-diabetic, anti-inflammatory and anti atherosclerotic effects. As, lower levels of adiponectin have been reported in subjects with obesity, diabetes and cardiovascular disorders, so adiponectin enhancers can prove to be useful in treating the obesity associated disorders. This will lead to improved health and better patient compliance. As obesity is increasing at an alarming rate around the globe, with effects on other body organs too so the population should be made aware with awareness programs where the children should be more focused. D Segula. Complications of obesity in adults: A short review of the literature. Malawi Med J. 2014;26:20-24. A-Brown RE and Kuk JL. Consequences of obesity and weight loss: a devil's advocate position. Obes Rev. 2015;16:77-87. Daneschvar HL, et al. FDA Approved Anti-obesity Drugs in the United States. Am J Med. 2016. Matsui Y, et al. Metformin reduces body weight gain and improves glucose intolerance in high-fat diet-fed C57BL/6J mice. Biol Pharm Bull. 2010;33:963-970. Nayak BS, et al. Plasma adiponectin levels are related to obesity, inflammation, blood lipids and insulin in type 2 diabetic and non-diabetic Trinidadians. Prim Care Diabetes. 2010;4:187-192. B-ALNohair S. Obesity in Gulf countries. Int J Health Sci. 2014;8:79-83. Pi-Sunyer X. The medical risks of obesity. Postgrad Med. 2009;121:21-33. D-Al-Goblan AS, et al. Mechanism linking diabetes mellitus and obesity. Diabetes Metab Syndr Obes. 2014;7:587-591. Golay A, Ybarra J. Link between obesity and type-2 diabetes. Best Pract Res Clin Endocrinol Metab. 2005;19:649-663. C-Jung UJ and Choi MS. Obesity and Its Metabolic Complications: The Role of Adipokines and the Relationship between Obesity, Inflammation, Insulin Resistance, Dyslipidemia and Nonalcoholic Fatty Liver Disease. Int J Mol Sci. 2014;15:6184-6223. Tortora GJ and Derrickson B. Principles of Anatomy and Physiology. Ed. United States of America: John Wiley & Sons, Inc. 2009. pp.127-128. Chandran M, et al. Adiponectin: More than just another fat cell hormone? Diabetes Care. 2003;26: 2442-2450. Nelson DL, Cox MM. Lehninger Principles of Biochemistry. Ed. United States of America: W.H. Freeman and Company 2008: 934. Ghoshal K and Bhattacharyya M. Adiponectin: Probe of the molecular paradigm associating diabetes and obesity. World J Diabetes. 2015;6:151-166. Ruan H and Dong LQ. Adiponectin signaling and function in insulin target tissues. J Mol Cell Biol. 2016. Lindberg S, et al. Adiponectin, type 2 diabetes and cardiovascular risk.Eur J Prev Cardiol. 2015; 22: 276-283. Swarbrick MM and Havel PJ. Physiological, pharmacological, and nutritional regulation of circulating adiponectin concentrations in humans. Metab Syndr Relat Disord. 2008;6:87-102.